Sony BDV-E870 review | What Hi-Fi? There’s nothing more convenient than having someone else do all the work for you. 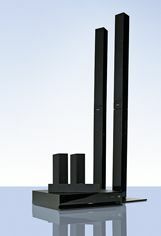 When it comes to home cinema systems, this ‘someone else’ usually takes the form of a speaker auto-calibration system. Of course, some systems do it with varying degrees of success, and this Sony wasn’t quite up to scratch. But, a quick spot of tweakage brought things into line. This system produces a punchy and exciting sound. As The Rock and Samuel L Jackson pursue the bad guys during the opening sequence of The Other Guys, the Sony conveys a great sense of drama and dynamism. Gunfire rattles around your listening position around while the rear speakers are more than willing to make their presence felt. The Sony BDV-E870 could handle the switch from all-out action to more understated soundtracks with greater style. It isn’t the most subtle-sounding system, nor does the speaker arrangement produce quite the same cohesion as others – the sub sounds a little disjointed, for example. Picture quality, though, is exemplary. In keeping with the stellar quality of the company’s 3D Blu-ray players, the E870 produces one of the sharpest, most pristine pictures in its class. It’s also wonderfully adept at tracking fast motion and keeping edges intact. A spin of Avatar shows that 3D images are rendered superbly too. Colours are judged to perfection, as are contrast and low-light detail. Feature-wise, Sony can’t find space for a few features offered by rivals. For example, an iPod dock costs extra, as does the wi-fi dongle – and surprisingly, there are no HDMI inputs for PS3 owners. On the plus side, Bravia Internet Video offers one of the most enjoyable online experiences of the bunch, with ultra-quick access to services such as BBC iPlayer, Five Demand and Sony’s own Qriocity service. If you’ve a large room to fill the Sony will do it without any problems, although rival systems have a sonic edge. Picture quality is mightily impressive and it’s competitively priced. All-in-all, it’s a worthwhile audition.